Made in Thailand, designed by the Japanese, the 2016 Mitsubishi Triton arrived with new updates from its predecessors and a welcomed price cut. This fifth generation Triton is available in the GLS, GLX, and Exceed variations with increasing features and price-tags as you go up. At entry, you get 16-inch alloys, seven air bags, heavy duty suspension, and the standard bluetooth, aircon, and a trip metre. Opting up a notch for the GLX you’ll get an extra in on your wheels, more than 6-inch touchscreen, standard suspension, dual-zone climate control, side steps, fog lights, and digital radio. The Exceed adds on paddle shifters, keyless entry and start, a bigger touch screen with satellite navigation, leather seats, and electronic differential lock. In comparison to previous versions, the 2016 Triton has more legroom and general interior space, as well as comfier sits with better back support. 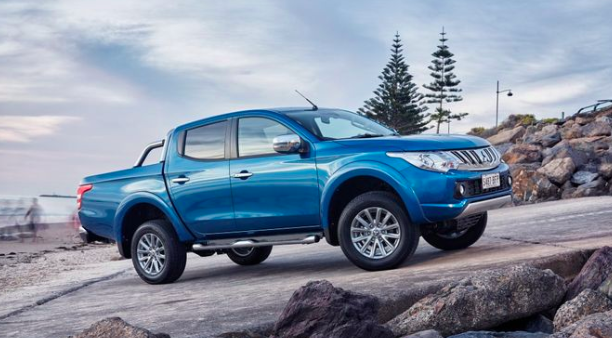 Safety: The Mitsubishi Triton received a full 5-star ANCAP rating. Engine: 2.4 litre 4 cylinder turbo diesel engine with either a 6-speed manual transmission or the choice of a 5-speed automatic transmission. It makes 133kW and 430 Nm. Fuel consumption is reported at 7.2L/100km for manual and 7.6L for automatics. Some test drives report higher rates but it depends on the drive mode and terrain. Urban carbon emissions for urban tailpipe outputs are reported at 230 g/km. Warranty is 5 years or 100,000 Kms with servicing at 15,000 or annually. Pricing is capped on servicing. New models of the Mitsubishi Triton start at $32,490, not including on-road costs, and go up to $47,490, also excluding on-road costs. For single cabs, entry is as low as $24,490. Additional $550 added on for premium exterior colours. The asking price for used, private sells starts around $11,000 and goes up to $40,000. The price greatly depends on the specific model, number of owners, documented service history, accident history, kilometres driven, extra features, and general wear and tear. The 2016 Mitsubishi Triton is one of the newer utes that still requires a timing belt change. You should check with anyone selling a used Mitsubishi Triton to see when this has last been done. Other than that, well cared for Tritons are very reliable vehicles with a good history of owner satisfaction. Pros: Price cut from previous models, roomier and more comfortable with upgraded audio systems. In general, handles city and off-road driving quite well with a better engine than predecessors. Cons: Slightly low for some of the rougher terrains, can be slow on acceleration, and not the smoothest ride compared to competitors.